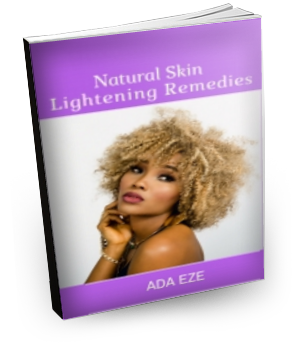 Over 50 Natural Skin Lightening Remedies. All with natural products to create a home-made formula to lighten skin naturally without being exposed to toxic cancer-causing chemicals. There are also recipes to lighten dark lips, dark elbows, dark knees and knuckles. If you are concerned about your uneven skin complexion or pigmentation spots on your face, dark elbows and knees as well as dull skin, you have come to the right place. In this book you will find tips to lighten and rejuvenate your skin naturally. Dark and dull skin can be brought about by over-exposure to direct sunlight without protection. When your skin is exposed to UVA rays, it produces an excessive amount of melanin which when you are younger gives your skin the appearance of an overall even tan. As we become older, this melanin has a tendency to clump together in areas that have been over-exposed to sun. Skin discoloration can also be caused by acne, infections, wounds, eczema, contact dermatitis, environmental pollution, poor lifestyle choices and prolonged use of chemically produced cosmetic products. Learn how to safely lighten your skin and regain a perfect complexion just by using all natural techniques and recipes. I am glad I found this book. I have always been embarrassed about my black lips because of smoking and I used just 1 recipe here and started noticing a difference in a short time people started complimenting me on how my lips looked so I went ahead to try some other remedies in the book and my skin glows now. Thanks a lot Naijabeauty. I actually got a copy of this book for a friend who used to bleach. She was offended at first but now her skin is getting back to normal and she glows and her black knuckles have improved a lot. She thanks me now everyday. Hey….. Just to say thank you for this book. My skin has never looked better and to think it costs next to nothing to buy the items I need most of which are in my kitchen anyway. Thank you Ada. I am glad I did not ignore it because I thought my skin did not need improvements but I can’t believe how even my skin tone is and how it glows. I had black lips from smoking and started using some solutions in this book and now people comment on how much better they look.